In August 2011 the RMS held a community workshop where they called for interested community members to be participants in a Design and Heritage Focus Group. The stated purpose of this group was to meet regularly and was an opportunity for participants to positively contribute to the project. The conduct of the Design and Heritage Focus Group was an extremely disappointing example of process requirements versus genuine, community-based outcomes. Arguably conflicting expectations contributed to the considerable participant disquiet about how the focus group was conducted. With hindsight it is clear the project was far more advanced than was being publicly acknowledged, resulting in an unmet expectation that community input would achieve adjustments to the project the RMS had no intention of making. A broad review of email exchanges between participants and RMS officers left the clear impression RMS personnel involved in the process were not unaware of this situation. Indeed, when confronted with issues they were unwilling to address, the misleading response made by RMS personnel was the EIS was the time for articulating objections. Given the objections that were vigorously and unmistakably directed at the entire concept behind Option One, waiting until the EIS was lodged represented an unconscionable waste of public resources, leading to the very unpleasant conclusion the RMS was simply stonewalling until project expenditure and development was, in their opinion, at such a stage as to be unchallengeable. One Focus Group member, after direct approaches failed to correct repeatedly raised concerns, tabled a document at what turned out to be the last meeting of that group, detailing these issues. Many, if not the majority, of community participants shared the concerns raised. An initial agreement between the RMS and Focus Group members was that their discussions would remain confidential. In the face of vehement protests from community members, this agreement was reneged on by the RMS when, at the penultimate meeting, they declared they would publish “notes” of all the meetings. At the last meeting of the Focus Group a community member requested information regarding the background and purpose of another group whose participants had been paid to comment on the Project. “A deliberative forum was conducted by GA Research on behalf of RMS on 30 May 2012. The objective was to explore knowledge and perceptions of the Windsor Bridge Replacement Project among the community.” (Windsor Bridge replacement project Environmental impact statement Volume 1 - main report, P130). As often happened in the EIS this information only told part of the story. As advised by some of the people involved, selected Windsor residents received phone calls inviting them to attend a local community issues forum. Some participants received a follow up email confirming the details and the amount they were to be paid to say thank you for their time. In the email, the company concerned is identified as AFS Smart Askers. A meeting of around 40 people was held in the Council Function Centre on the evening of Wednesday, 30th May. Apparently after about half an hour of discussing a range of issues, including policing, the RAAF base and road works, someone mentioned the Windsor Bridge Project. At this point a group of about 8 people stood up and identified themselves as RMS representatives. They then proceeded to give a presentation about the Bridge project and the community participants were asked to give their response to certain design elements. Based on the description of a community member who was there, it seems there was some type of ‘worm’ device used to record their responses. After about three hours the meeting ended and people were given envelopes containing cash. We have spoken to a number of people who attended and of those people, some claim they were paid $175 while others say $200. All payments were reportedly in unmarked envelopes. There may have been other amounts as well. The RMS did not appear to have planned to discuss the existence of the ‘deliberative forum’ with the Focus Group, however it did, with prompting, respond at the final Focus Group meeting to the request for an explanation. What followed simply heightened the frustrations of much of the Group. Indeed the information provided seemed to also offend members of the RMS team who were present, one of whom approached at least one community members after the meeting and said, more or less, “I just want you to know I agree with you entirely. I have been involved in hundreds of these types of projects. I have never seen anything like this I will probably be hauled over the coals for saying this. I don’t care”. At the final Focus Group meeting RMS staff asserted that consultation regarding the Windsor Bridge Replacement Project was extensive, implying that it was unprecedented in NSW. In fact one of the RMS officers said it was the most extensive consultation ever carried out by the then RTA. That being the case, what prompted the RMS to then pay privately approached local community members to give feedback on the Project? The RMS engaged a very large public relations company, Kreab Gavin Anderson to run a community forum. Selected Windsor residents received phone calls inviting them to attend a local community issues forum. The invitation included offering to pay them for their time and was followed up with an email confirming the details and the amount they were to be paid for their time. (Copy of a de-identified email, above). A meeting of around 40 people was subsequently held in the Council Function Centre on the evening of Wednesday 30th May. After about half an hour of discussing a range of issues, including policing, the RAAF base and road works, someone mentioned the Windsor Bridge Project. At this point a group of about 8 people stood up and identified themselves as RMS employees. The RMS officers proceeded to give a presentation about the Bridge project and the community representatives were asked to give their response to certain design elements. It seems that there was some type of ‘worm’ device used to record their responses. At the end of the meeting people were given envelopes containing cash. Of the four participants who contacted CAWB, some were paid $175 and others $200, all in unmarked envelopes. Four days later, on 4 June, members of the Windsor Bridge Focus Group were notified of their next meeting date, 13 June. On 11 June the RMS started emailing members of the Focus Group to advise that the next meeting, to be held on 13 June, would be their final meeting. This email included the meeting agenda . The final Focus Group Meeting was well attended, despite it being a State of Origin night. However about halfway through the meeting a group of Option One supporters stood up and announced they were leaving to go and watch the footy. Having alerted the RMS before the meeting commenced of his intentions, before the meeting concluded, a member of CAWB requested that the RMS explain about paid consultations on 30 June. The Focus Group was advised the paid consultations were an attempt by the RMS to better understand how widely understood and appreciated the project was. When asked how participants were selected they were advised the RMS had put together lists of people who had written to the government, written letters to papers, or called and spoken to them. When asked if this meant they had compiled a database of people they didn’t want to speak to the RMS officer became slightly flustered and denied it, describing the Focus Group as ‘elitist’. This epithet was not well-received by the group. It was stressed the whole purpose of the paid consultations was reaching new, previously unheard community members, however, in defending the RMS against the ‘database to identify who not to invite’ question, claimed there were ‘a couple of familiar faces’ at the paid consultations. Subjected to further questioning speaker admitted the RMS formed the group and the RMS was responsible for its composition and functions. He was again questioned as to why it was necessary to pay local residents to provide feedback about Option One. During this exchange a second RMS officer made a brief speech, claiming the Windsor Bridge Project was the most consulted project ever and that her manager had authorised the paid consultations due to her desire to make sure that the consultations were comprehensive. At other times RMS officers insisted that the selection of participants (as opposed to their exclusion) and any payments were entirely the responsibility of the company undertaking the research and that such payments were ‘standard practice’ for the type of consultation. At the end of the meeting a member of the RMS team separately approached both people who had particularly challenged the paid consultations. He was clearly extremely angry and said, in summary: I just want you to know I agree with you entirely. I have been involved in hundreds of these types of projects. I have never seen anything like this. I will probably be hauled over the coals for saying this. I don ‘t care. The following exchange further confirms the RMS’s connection with the event on 30 May 2012. Just getting my head around the consultation processes. 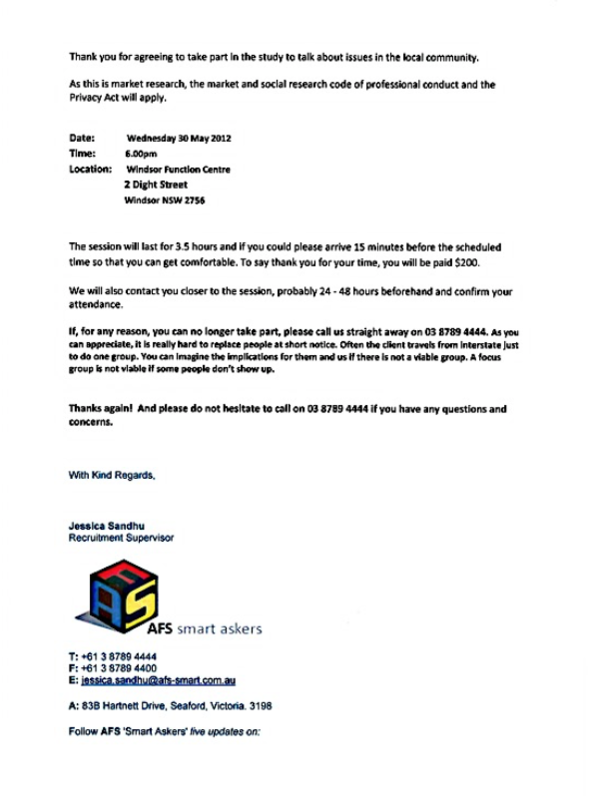 Some participants at a community forum on 30 May, which was also attended by RMS staff, reportedly received letters from a company called AFS Smart Askers regarding their attendance at this event. The Gazette, dated June 20, 2012, reported that an RMS Spokesperson had indicated that consultations held on 30 May had been run by KGA Research. It seems there may either have been three different events on the one evening, or possibly three different companies were involved in the one event... or two companies and one typographical error! Which companies assisted the RMS with any and all community consultations throughout the project. In what capacity was each company engaged. How consultants were selected and engaged. The brief that was given to the consultant for each engagement. The objectives for each activity. Post event evaluations and outcomes. Any actions resulting from the event/s, including copies of resulting data and advice as to what use such data was put. Finally and most particularly, could I have detailed information regarding any and all community consultations held on 30 June* this year. Hope you had a joyous and peaceful Christmas and got some time away from the 'salt mines' over the festive season. Sorry to hassle, just wondering when you will be in a position to provide answers regarding consultations as raised in my email of December 3 (below). I'm hoping you can assist. I understand Iain is on leave until March. I urgently need some advice regarding the consultation processes (see emails below). Happy NY also. I'm also on leave until the 21st of Jan, but I'll see if I can get someone to help you in the meantime. Also, regarding the company that facilitated the forum on 30 May 2012 it was GA Research of Level 4, 151 Macquarie Street Sydney. I'm not sure who AFS Smart Askers are, but I'll see if we can find out. Hi Roy, many thanks for getting in touch. I apologise for disturbing your break. I note that GA Research is the company name used in current documents, however the Hawkesbury Gazette reported an RMS spokesperson as identifying the company as KGA. Are they one and the same? Also re AFS, I attach a de-identified copy of a letter sent to a participant from that company. If you look at GA Research's web site (http://www.garesearch.com.au/) it states that they are a division of Kreab Gavin Anderson which is their worldwide parent company. So I guess this is where the confusion came from. Judging by the letter you attached it appears that AFS may have been subcontracted by GA, but I will get that confirmed. AFS Smart Askers is a group that sources and selects participants for research activities (according to location, age, occupation). GA Research used them to find participants for the community forum held on 30 May 2012. Of the records I have available to me, GHD were engaged in July/August 2011 to assist RTA/RMS in the communication and consultation activities for the project. A number of the outputs from this work can be found on the RMS project website, under project documents. We don't have any record of consultations being held on 30 June 2012. I'm wondering if you have further information that may assist my search. I hope you have a lovely 2013 and keep in touch if I can provide further assistance.